Below is the email newsletter that I sent a few days ago. Put your email in the cute little box if you would like to receive my future email updates (about art, yoga, Mexico, NY, and more) direct to your inbox. So the rain has (mostly) stopped in NY and it finally feels like summer around here. I'm grateful for the full creative plate that life served me in June and am excited about the artistic goodness in July & beyond. The fun begins tonight with The Love Show at Spread Art in Bushwick / East Williamsburg, Brooklyn. passion, destruction, construction, and oppression. acrylic, wood, photography, video and more. Several pieces invite your participation, and of course there will be beer, wine, and live music to make your night complete. below for the McKibbin Street Fair on Saturday, July 25th. The street fair is presented by AKA Potion, a great cafe in Bushwick / East Williamsburg that is known for its strong support of local artists. The fair is coming up soon, but there are still opportunities to get involved. Beginning in August, Thomas Bell and I will be curating the walls of the walls of Mojito Loco,, a fabulous restaurant and bar with inspirational mojitos and a mouth-watering latin fusion menu (including lots of vegetarian options). Watch for upcoming information about the first show: Spread Small Works. Looking ahead to September, I'm working with Spread Art to host an exhibition / fundraiser for Through the Eyes of Hope, a nonprofit founded in 2006 by photojournalist Linda Smith to provide photography classes to kids in Rwanda. Click here for a sneak peak at the children's beautiful images. Through the Eyes of Hope continues its program in Rwanda and has expanded to additional locations, including the Bronx. As Through the Eyes of Hope grows, they remain true to their mission to encourage children to photograph the world through their eyes. Yep, a lot is on the horizon...and it comes on the heels of many fabulous things that just happened, including two days of Creative Kids on Bedford, as part of Willilamsburg Walks. On Saturday, June 27th and Saturday, July 11th I was on Bedford Avenue with tons of art supplies to facilitate kids and adults letting their creativity flow. Both afternoons were incredibly inspiring and liberating in the way that only making art with kids can be...as they have yet to form rules or judgments about what art is. Read more & see additional photos of Creative Kids on Bedford here. Also in the just finished stage is the Summer Group Show at Spread Art. A group of artists representing a wide range of mediums displayed their take on "Improvisation." The Tronic provided live sonic variations on the theme. All in all summer in NY continues to unfold in ways that inspire and surprise me. There is a lot more to share, including overdue stories from spring in Mexico. Keep an eye on the Live Bliss blog for upcoming posts on the Primavera Parade in La Manzanilla (lots of kids in butterfly & Tiger costumes), plus observations about my transition from Mexico's Pacific Coast to New York's hippest borough (Brooklyn). P.S. As always, please let me know what's new in your world and feel free to forward this email along to others who might be interested. The Love Show last night was packed. It was hot, humid, and eventually rainy, yet people continued to arrive and stayed until the end to enjoy great music, good company, and most importantly to absorb over 20 different artists' take on "Love." Below are photos from the evening. If you didn't have a chance to stop by last night, you still have time to catch some love. The Love Show is on view for one more day - tomorrow (Sunday 7/19) from 12pm - 6pm. Many thanks to Jethro of iloveyou for curating such a fabulous show. This week's Village Voice highlights The Love Show, opening this Friday at Spread Art, among its picks for the weekend. How sweet is that? Mark your calendar to help Spread the Love this Friday at 7pm by enjoying (and...hint, hint...buying) art, meeting the 20+ included artists, giving props to Jethro of iloveyou who curated the show, plus (of course) enjoying cold beer and hot music. Group show displays affection, in general. What is love, and what does it look like? Spread Art Gallery asked artists throughout the country to submit their ideas of this complex sentiment, whether it be "love as a force of good, force of malice, force of height, of hate, a force of God, creation, destruction, oppression" and on and on. Twenty artists and designers were chosen to be a part of The Love Show—including our very own art director, Ivylise Simones—which includes a variety of mediums such as oil, acrylic, wood, photography, and more. Tonight's opening party includes a set by Knight & Gale and Eastern Sweats. I was back on Bedford Avenue today making art with kids as part of Williamsburg Walks. Thomas Bell and I packed gobs of art supplies onto the Spread Art & Live Bliss art cart and wheeled it through Brooklyn, from Bushwick to Williasmburg. As soon as we were set up we had lots of art partners, some of whom were return collaborators from a couple weeks ago when we were on Bedford. With stickers, markers, colored pencils, glue sticks, glitter, pattern scissors, shells, string, and ribbon, we created a variety of colorful (and sometimes messy) wearable art. Most of the kids that visited the Spread Art & Live Bliss booth have lived less years on the planet than they have fingers on their hands, which means they aren't concerned with questions like: "Is this art or craft?" and/or "Should I price my work based on time spent or materials cost?" It is pure fun for fun's sake, and the enthsusiasm the kid's bring to: 1) drawing on a sticker, 2) putting it on their shirt, and 3) showing the world, is absolutely contageous. If you know of an upcoming private or public event that could benefit from a kid's art setup like this send me an email. Adding yoga and/or music to the art projects is also an option. Below are photos from the day. Enjoy! Above: As soon as we got set up we were greeted by the familiar smiling face of a girl who made art with us when we were on Bedford a couple weeks ago. Above: A new face who assured me she is 7, although her sister was convinced she is actually only 4. Above: Thom helping a girl put on the wearable art she created. Above: This is the moment the top was taken off a glue stick and things got consequently got very messy and glittery. Above: Thom adding some color to the street. Above: Packed up and ready to roll back to Spread Art. Call for Participants! McKibbin Street Fair! Saturday, July 25th! Collaging on Bedford: Join me this Saturday! This Saturday from 12pm - 6pm I'll be on Bedford Avenue in Williamsburg, Brooklyn (said to currently hold the title to "world's neighborhood most densely populated with artists") with collage materials and a whole lot more. Why? Because it will be fun! I hope to see you on Saturday. If you can't make it but are interested in learning about future events like this (or booking you own), send me an email. Join us for a playful, creative afternoon of collage and bookmaking outside on Bedford Avenue, in the heart of one of the world's most inspiring neighborhoods! Kids of all ages will enjoy mixing and matching images, adding color and text, and ultimately exploring the stories to be found their creations. Participants will be invited to display their work for the afternoon as part of an on-site exhibition that will develop and evolve throughout the day. All necessary supplies provided, but feel free to bring along your favorite art and craft materials. Whether you are a kid, have kids, or are a child-less adult who wants to collage in a collaborative atmosphere where age is irrelevant, I hope to see you on Saturday! Part of Williamsburg Walks (follow the link to the left to see more of the day's activities). I've been back in NY a few weeks now and am beginning to find my art groove along with my yoga bliss. Thanks in large part to Thomas Bell, founder of SPREAD ART, I've got a ton of projects on my creative calendar (its called a creative calendar not because it tracks art stuff, but because I usually need to be really creative to get everything done on time). Below are details about happenings at SPREAD ART in June, beginning with "Improvisation," the '09 Summer Group Show that I'm a part of along with photographer's Irina Adam and Phil Petrocelli and 7 other artists. "Improvisation" opens Thursday, June 11th at 6pm. If you are around NY I hope to see you so we can improvise conversation over a glass of wine or a latte while looking at a fabulous selection of painting, collage, photography, mixed-media work, and more. SPREAD ART is located in Bushwick/East Williamsburg, Brooklyn, at 104 Meserole Street (b/w Manhattan & Leonard). Take the L to Montrose or the J/M/Z to Lorimer. More details about "Improvisation" are on the flyer below, which features one of my photographs (left) and an image of Phil Petrocelli's (right). Click the image for a larger view. Prior to June 11th, how about coming to aka Potion on Sunday, June 7th at 4pm for the simultaneous opening/closing event for "The Art of Letting Go" during Bushwick Open Studios? "The Art of Letting Go" is a collaborative mural performance led by Thomas Bell that includes myself as well as Katharine Ng, Avoid Pi, Heather Garland, and more. The image at left is a "work in progress" view from very early on. Artists have continued to add, subtract, and layer over one another's work. Note: Don't be late for the opening/closing or you just might miss it. The full announcement for SPREAD ART events in June is below, and as you will see there are a ton of things happening, including music, art, and - beginning next week - I'm teaching yoga Mondays, Wednesdays & Fridays at 6:30pm. Click the images below to view them larger size. A lot of work is going into SPREAD ART to get it ready for a summer of creative fun. I'm doing what I can to help out, and at the moment that means less time updating blogs and websites and more time painting walls and laying floors. I have many posts I'm itching to add from my last couple months in Mexico, including photos from the kid's Spring Parade and an adventure to milk cows. Please check back periodically for updates and don't get confused when there are NY stories mixed with Mexico stories. Posts are likely to be as jumbled as a lot of my thoughts these days. Thankfully a few things remain constant whether I'm in La Manzanilla or Bushwick, such as my ongoing desire to learn to dance. April @ LiveBliss: Yoga, Dance, Meditation & Art! Once again I'm overwhelmed with gratitude to be a part of what is happening at LiveBliss. When I opened the space a few months ago I had a 3 word development plan: Art, Yoga & Life. I figured I would at some point sit down and flesh that out a bit more. So far I've been happily following what life brings and playfully spending my time doing and being instead of planning. Those of you that have seen the current yoga schedule on the door of LiveBliss - with its scratched out previous schedule and hand-written new days & times - know that I've really gotten quite relaxed about things. I wonder how many business rules of thumb I'm breaking by using my barely legible handwriting to convey information in the day and age of computers? Oh well, it is a temporary fix (read: manana I'll print new flyers...which in classic Mexico fashion I've been saying for over a week now) and honestly one I'm wearing as a badge of courage given my former non-blissful Type-A ways. Below is the latest schedule of happenings at LiveBliss in April. This being Mexico and life being one big creative improvisation, there are sure to be changes throughout the month. Check back for updates or feel free to email me with questions. Karen, a yoga teacher visiting for a couple weeks from Colorado Springs, Colorado will guest teach this yoga class and is generously donating her time. Yoga in Spanish - Pay what you wish! Everyone is welcome to enjoy these classes, regardless of yoga experience &/or language fluency. Mats and blankets are provided. All you need to bring is your body. Come check it out yourself and please help spread the word about the free / by donation yoga opportunities to others who may be interested. You can learn more about Christina's yoga classes at the bottom of this page. Class taught by Carlos Eloy Tlores Munguia in Spanish, with English translation as needed. Read more (in Spanish) about this series here. Professional dancer Jean Pierre is teaching everything from salsa to belly dancing to polka (no joke!). It is *tons* of fun and a great workout. I woke up this morning full of strange energy and sensations. I thought perhaps it was residual emotion from yesterday, as one of my best friends left after a 2 week visit and I guided the last of a 6 Saturday Yoga & Art series. I found my way to my yoga mat to wake up, invite some space into my body, and have a closer look at what was going on inside, figuring I was in for a dose of processing yesterday or other recent events. On the mat a whole lot of thoughts, feelings, sensations and visuals arrived, as if I'd had some new self-awareness faucet installed when I wasn't looking. Out flowed a clear stream of updated dreams and desires, mixed with some time-worn fears and doubts. I'll admit that part of me reacted with a, "damn, maybe I should have skipped this and gone for coffee and the online Sunday Times instead." I've been feeling pushed to my saturation point recently and part of me is lobbying for a shut down of some sort. The other parts of me are negotiating for some life changes that don't include a "sorry, I'm closed" sign. It was in this state of mixed-mind that I headed for the scissors and glue sticks. As usual what arrived didn't connect to what was on my conscious mind while combining images. I was looking for answers to questions about what came up in yoga this morning, but what I received related to questions that were on my mind earlier in the month. There seems to be a time delay between my heart's current affairs and questions, and my soul's interpretation and guidance. It reminds me of the shutter lag that existed with the first digital cameras - that time gap between when the shutter button was pushed and image the camera actually captured - resulting in pictures of the moment after people stopped posing. Maybe that is a more apt metaphor than I realize, and what I'm receiving are honest glimpses of my heart's desires and my soul's journey, rather than neatly posed and packaged images that can only be held for a matter of seconds. Whatever is going on, I'm continuing to explore and enjoy the process. For those of you in or around La Manzanilla, I plan to hang all collages from this series next week at LiveBliss and leave them on view for a few weeks. Explore just where I am because that is all I ever have. Drop the stories & illusions. No matter what its going to be a messy journey. Let it all spill open. Everything I need to know is inside. Above: What Price for Love? This afternoon, after teaching Saturday's Yoga & Art class, I took a bike ride to Tenacatita, a beautiful beach town about 12 miles (the way we went) from La Manzanilla. I'm so grateful to Bill who got the word out that he was taking this ride and invited others to join. Although I've been surrounded by "open space" during the past year in Mexico, I haven't had as much hiking, mountain biking, camping or trail running time as I would like given the beauty that surrounds me. To my knowledge, there aren't many trails available and riding on the highway is a bit on the dangerous side for my liking (two lane curvy highways with no shoulders and lots of large trucks). We did ride for a brief stretch on Highway 200 today...just enough to give me a bit of a rush, but not enough that my mother needs to begin worrying. On the way back we opted for a ride through a papaya plantation instead of returning to the road, which involved walking through nearly-waist high grass for a bit to get to the trail. At that point I was banishing all memories of the snakes and scorpions I encountered last summer. I returned to La Manzanilla exhausted and covered in dirt, so I did the only logical thing which was to immediately go to the beach for a beautiful evening swim. At the beach I ran into a couple kids from last Sunday's Art Afternoon who are excited to return to LiveBliss for more of the same tomorrow. One of the kids sold the collage she made last week, which thrilled me to hear. After a morning spent guiding yoga & art, an afternoon bike ride with people who were mostly strangers to me 24 hours ago and now feel like old friends, and an evening at the beach where I saw kids who I will get to make art with tomorrow, all I can think is that my life is more full than ever and I am damn grateful. Thank you to everyone and everything that helped bring me to this moment. Below are some photos from the bike ride. Click the images to see larger versions. Above: Looking inland of the beach. Above: The cobblestone road that we climbed toward Blue Bay Resort. It amazes me that even though there has been no rain for months, gorgeous flowers continue to bloom. Above: Two riding partners from today, including Bill (right) who has spent enough time exploring the area on his bike to figure out today's ride to Tenacatita and a whole lot more. Above: After a couple miles climbing a cobblestone road, we came to look toward a different gorgeous beach including, I think, Tenacatita at the far end. I'm always sore after a long bike ride, but the cobblestones added an interesting extra element today. Above: We spent a lot of time riding on dirt roads like this one. In addition to a wealth of birds, we saw bunches of cows (including a very cute and very young black fluffy one that I was too lazy to pull my camera out to photograph...please use your imagination on that one). Above: Lots of egrets were around as we passed through this mangrove area. Above: I saw bird's nests and more bird's nests today. I stopped getting excited and counting after the first 5 (short attention span). Above: One of many papaya fields full of small plants loaded with gobs of large fruit. Someone told me once that the papaya trees have been genetically modified to grow small so they are easier to harvest. Today I was told the small ones are just younger and bear the super-sweet papayas. I hope that's true. Above: In Tenacatita I saw this sign (the green one on the right) that said "Parking" for something. I thought it was one of the nicest parking lots ever. Above: Another shot of the flowered parking lot. Above: A mile marker. I have a fascination with highway signs. I can't help it. Above: Rich passing a roadside restaurant. Above: When I said I returned covered with dirt I wasn't kidding. My ankles and legs may be dirty but my feet show I left the house clean! Above: Exhausted, but damn happy. And why not? I'm leaning against a palm tree in front of the house where I live, which is across the street from a gorgeous beach. Everyday isn't perfect, but the views are always fabulous. Today's afternoon of art at LiveBliss was tons of fun, with about 10 kids and a handful of adults making collages or drawings. Thanks to a donation of sidewalk chalk, the sidewalk outside LiveBliss is now decorated with a beautiful rainbow and flower. A couple kids also tried facepainting with the chalk, which went about as well as you can probably imagine. There is an Art Fair in La Manzanilla on March 15th and many of the kids that came today are planning to go to the jardin that day to sell the pieces that they made. There will be another afternoon of art at LiveBliss next Sunday, 2pm - 4pm, so if you are nearby please stop in. Kids are free. Adults by donation ($10 pesos / US$1 suggested). Donations help cover the cost of glue sticks, scissors, etc. Thanks to MaryBeth for helping organize & assist, to Macy for donating the sidewalk chalk, and to Karen and Randy for donating tons of magazines to the community. If you are in / around La Manzanilla, I hope you can come to LiveBliss for two Sundays of collage-making in a fun, playful atmosphere. Regardless of whether you consider yourself creative, you will enjoy mixing and matching images and exploring the stories you find in your creations. For more information, email or call 315-5672. Si estas en o cerca de La Manzanilla, deseo que vayas para dos domingos de arte cuando vamos a hacer collages en un entorno divertido y alegre. No importa si creas que eras creativa o creativo, vas a disfruitar mezclando imagines y buscando los cuentos que tus obras muestran. Para mas informacion, manda un correo o llama 315-5672. Recently I posted tons of rodeo photos from the Fiesta del Toros that took place a couple weeks ago. I was quite surprised to find myself so close to both the bulls and the bull riders, and I had a great time taking photos of the various eye-popping scenes I witnessed - including the bullriders putting on their chaps and their game faces, bulls and riders flying in every direction, and bullriders and fans drinking tequila to celebrate a particularly good ride. Click the images to see them in a larger size. Below are the latest collages that are revealing themselves to me throughout the month of February. As I finish each one, I am hanging it on the wall of LiveBliss. I am about half way done with the series, assuming it will end when the gallery is full...although it seems silly to think that this group of images will tell a story that is somehow based on the square footage of a random space in Mexico. Then again, it seems just as silly not to think that. If there is one thing this process has taught me so far, it is to loosen up and worry less about how neatly things wrap themselves up. Everything is always perfect just as it is, even when its not. I took another trip to Manzanillo this morning. These sunrise immigration trips are beginning to have a bit of a sacred ritual feel. That's not to say I'll be sad when I pick up my FM3 lucrativo in March. It just means I'll have a reason to look forward to next year when I'll take these drives again in order to renew my immigration documents. Here are a few photos from today's journey into the dawn. I had fun playing not just with the changing light and landscape, but also with the haze created by dusty car windows. Earlier today I was interviewed by Stacey Shanks on her Yoga and Life blog talk radio show. Below is the announcement for the show. Click here if you would like to have a listen. "The Marriage of Art & Yoga"
Host Stacey Shanks as interviews guest, Christina deRoos, on how she brings together art and yoga to create a unique experience for her students. Once an attorney in Seattle, her life now consists of her love of photography and teaching yoga in La Manzanilla, Mexico, where her new studio / gallery, LiveBliss, resides. Have you wondered where the creativity you once had as a child went? Were you once uninhibited and a free spirit? Christina will offer techniques you can explore to uncover the creative spirit we all have. Below are the latest additions to a collage series I began recently. As I'm making these I am hanging them on the wall of the gallery. I've decided to use this "make & hang" process to allow the next LiveBliss exhibition to reveal itself to me (and everyone else who visits) over time. I smiled when I realized that I am now allowing life to be both the artist and the curator, as collage was not even close to the plan for February's show. It has been an interesting process as I've felt some discomfort about having mostly empty walls. There was a sense that if the doors are open and people are coming in...well, something is supposed to be there, right? In any case, allowing the walls to fill up slowly with just-made collages is the experience for February and it feels like a natural progression in my effort / non-effort to remove my self from my creative process. Here are a few more collages I did recently, continuing my exploration of the theme of emotions. We can't always eliminate stress from our lives, but we can change our relationship with stress. Using yoga, meditation and creative journaling, each week will explore a theme, such as Befriending Your Body, Acceptance, Choice, and Truth. Changing how we relate to stress can reduce or eliminate the symptoms caused by stress, and lead to a healthier and more deeply rewarding experience of life. This series is suitable for all, regardless of previous yoga or art experience. Poco a Poquito...LiveBliss is almost open!!! Slowly I'm getting there. LiveBliss is on track to open any day now. My friends Tracy (visiting from Missouri) and Beto (my best friend here) helped me prep the space to hang photos today, and then we broke out some art supplies for Beto's kids. Watching the kids create with abandon and then hanging their pieces on the wall was an over-the-top moment for me. Already the space has exceeded my expectations as today brought me more bliss than I could have hoped for prior to even opening. I'm thrilled that a weekly community drawing class is being offered at LiveBliss (which will officially open any day...). The class is taught by Mary Jo Oberg, a former art teacher who is generously offering the classes for free to the community. Mary Jo teaches drawing in a way that everyone - from beginners to experienced artists - will learn something new and successfully complete drawings using different techniques. I'm very excited that the painting below, "Violence Breeds Violence, But Hope Remains" is on its way to Miami to be exhibited during Bridge Art Fair. It is probably my favorite of all the paintings I have done so far. “Violence Breeds Violence, But Hope Remains” was done as a meditation on the United States government’s reaction to 9/11. The texture and colors mirror the violence, struggle, and desire for power that are a part of the long history of this story, while subtle curves reflect the opportunity that is present in every moment to make a different choice, to begin a new story. Christina deRoos is a mixed media artist and photographer, who for the past year has split her time between New York and Mexico. The majority of her work is abstract, and has become increasingly personal over the past three years, presenting a view of the thoughts, emotions, sights, and sensations that make up her existence. Convinced that within the individual dwells the universal, Christina explores her internal experience as a step toward understanding the world around her, and by presenting the results she hopes others may find a mirror to explore their experience as well. In addition to her personal work, Christina frequently facilitates creative projects that invite public participation and encourage community dialogue and individual self-reflection. This winter Christina will open LiveBliss, an art and community space in La Manzanilla, Jalisco, Mexico. In “Yellow Matter” bold fragments initially seem to be flying through a mysterious universe as if they were once part of a whole and had been shattered in space and left to drift apart. The arrangement and interconnectedness of each fragmented particle however, leaves one to wonder if they are drifting apart or if they are coming together to form something new. As with the universe itself, matter is transforming into and out of everything at every moment everywhere. Most of Thomas' paintings are improvisations done to music, and are generally abstract and texture based. His painting style developed out of his understanding of jazz improvisation. Listening to mostly John Coltrane or Miles Davis, Thomas tries to capture the energy of the music and improvise the paintings to transfer the the music to canvas. The flow of the music dictates the flow of each painting. The process is much like a free-jazz improvisation where the energy of each person performing is bound by the energy of all the others. Each successive stroke put down on the canvas is bound by and tied to the previous, and is a reaction to what came before it. The end result is a true improvisation that expresses individual freedom, personal struggle, internal and external conflict, and that presents a highly personal view of the world, surrounding situations and a moment of existence. I submitted a piece for Art Gotham's Square Foot Show. The theme Election 2008 was too much for me to pass up. Before I go any further I need to give a HUGE thank you to Rachel Seys for collaborating with me. The show opened last night (Saturday, 10/25) and will remain on view through November 8th. If you are in NY, I hope you will check it out. Directions & gallery hours are here. The piece Rachel and I created is called "We Are Not Our Governments / No Somos Nuestros Gobiernos." It is interactive, which means your participation is invited and encouraged. You can participate in person at Art Gotham, and/or you can participate electronically. In red is the information you need to know to participate electronically. For those of you in Mexico, you will be also be able to participate in "We Are Not Our Governments / No Somos Nuestros Gobiernos" in La Manzanilla at LiveBliss (a yoga, art and community space that I plan to open in December). Direct communication between individuals, as opposed to government propaganda and media sensationalism, will guide us to respectful relationships and fair solutions to mutual challenges. When governments fail to fairly represent individuals, the social contract is broken and there is no democracy. It falls to individuals to represent themselves and communicate directly from one to another. Need another reason? Art is fun. This piece was created for Art Gotham’s Election 2008 show. It was started by Christina deRoos in Jalisco, Mexico, and enhanced and assembled by Rachel Seys in Brooklyn, NY. Participants from Mexico include individuals of diverse age ranges and backgrounds. Many have visited the United States and most have relatives living and working there. All participants agree that the outcome of the US election will have a major impact on individual Mexican citizens and the rest of the world. “We Are Not Our Governments / No Somos Nuestros Gobiernos” will remain in NY through November, at which point it will travel to Mexico and remain open for participation through May, 2009. It will return to NY in June, 2009. The following are samples of the notes and quotes included on the pesos. The name of the person is included with the quotes. All notes were submitted anonymously. • How long will you be a slave to money? • It is necessary to plant good thoughts to improve what we have. • This paper is made of trees that are slowly disappearing. I hope that the emperor of dollars also disappears. • Barak Obama: Mr. Candidate, I wish you much luck with your campaign and hope that you work hard for your country so that your country and Mexico will succeed. • You do not find true spiritual happiness with your dollar$$$. • I ask the president and the American people not to use and discriminate against immigrants who are essentially blind and mute in the United States. "We Are Not Our Governments / No Somos Nuestros Gobiernos" is in the 2nd row from the bottom and is the 2nd piece from the left. Special thanks to Erin Partridge for providing these photos. Erin also participated in Art Gotham's Election 2008 show. Her piece can be seen in the photo above...look for the white eagle on a blue background. Its been a week of big changes and I'm trying to ground myself in the present as much as possible. This morning I checked out the birds and fruit and flowers and palm trees outside my new house. I came across this wheelbarrow full of ripening bananas that will be ready to eat in the next few days. Yesterday the gardener gave me 2 papayas from a tree in my yard that will be this morning's post-yoga breakfast, doused in lime that will also come from a tree steps from my door. The added bonus is that I have organic, local coffee and a french press on loan so it is not a Nescafe morning. Even when all is confusion and the impermanence of everything is painfully obvious, life is still beautiful and there are always wheelbarrows of ripening bananas. I'm excited to confirm that I'll be teaching yoga in La Manzanilla this winter in a gorgeous rooftop palapa. Starting December 1st and continuing through May or June I'll have weekly classes on Mondays, Tuesdays, Thursdays and Sundays. I will also offer a few evening classes throughout the winter (sunset restorative yoga and other special goodness). As if that weren't enough, I may soon have news about a Spanish Plus Yoga weeklong retreat in March. For now, email me if you would like to be added to the list for yoga updates, or if you are in La Manzanilla and would like to attend Monday and Wednesday 10am yoga classes which will continue through the end of October. I won't be teaching weekly yoga classes in November. Instead I am going to Patzcuaro and Janitzio for Day of the Dead and then will spend a bit of time in NY. On November 16th in NY I'll lead an art and yoga workshop exploring the theme of Balance with Erin Partridge, an artist and art therapist and constant source of creative inspiration for me both personally and through our collaboration as The Orange Matter. More details about that soon. I took a trip to Manzanillo today to grab a few things from the big city. It was rainy and overcast and blah. Coffee helped, but I still went a bit bonkers. I've been spending some time with a scanner lately so the Polaroids will continue to show up here bit by bit. Its exciting to actually do something with them other than stick 'em in a portfolio and wonder if they will mold in the humidity of summer in Mexico. See one you like? Prints are $50. Originals $150. Email with questions or to purchase. Original image above $old. Prints available for $50. I love working with Polaroids. I am sad that the film is no longer going to be available. I have resigned myself to switching to Fuji for instant film, but it isn't the same. On the bright side, it means I'll have to learn a new bag of tricks because the way I manipulate Polaroid film doesn't work with Fuji. Life once again gives me a reason to experiment, which is what I love to do. For now, here are some recent Polaroids, which is what I'll use until the well runs dry. Paul Benoit has a new CD coming out in January. It is called "Bluebird" and I've been lucky to get a sneak peek. I've basically had it on repeat since I got it. I love it that much. I had it in mind today when I took these photos, which Paul is going to use for the CD photography. Finally I have those images uploaded. Wow! That took forever. One of those projects that I just kept coming back to and not quite completing. Go figure. Images are in the gallery called Motion, and I'm including them in this post because I'm on a roll! So how much are they? 11"x17" archival prints (meaning they last a long time) are $150. You can buy prints of anything I post on the blog and also of images that are on my website. Email when you are ready to buy or if you have any questions (yes, other sizes are available...yes, I give discounts if you buy 3 or more prints). I'm now working on a zine with Erin and beginning a photo book with Tracy (both will be for sale in November). Here are a couple work in progress shots of my part of the zine. If you are in NY, mark your calendars for Sunday, November 16th. The Orange Matter (myself and fellow artist / yogi Erin Partridge) will facilitate a yoga and art workshop exploring balance. It will be at Think Coffee, 248 Mercer Street, from 4pm - 7pm. More details to follow soon. I got to sleep in a tent by the water during my time in the San Juans. It was amazing to be outside hearing the ocean sounds all night without worrying about scorpions and snakes. I did notice that there seem to be a lot less animals splashing around these days than in summers past. The sunrises were amazing. I positioned my tent so I just had to roll over and grab my camera in the mornings (I'm not much of an early riser). One morning in particular brought interesting results. Here are a few samples. Photos from a recent trip to San Juan Island, Washington. Click on images to enlarge them. Poco a poco I've been working on new paintings. Two are close to done. A few photos take during a weekend trip to Comala, a small town in the neighboring state of Colima, and another weekend I spent in Puerto Vallarta and Sayulita. In July I returned to NY for the opening of a show photographs I took this past year. 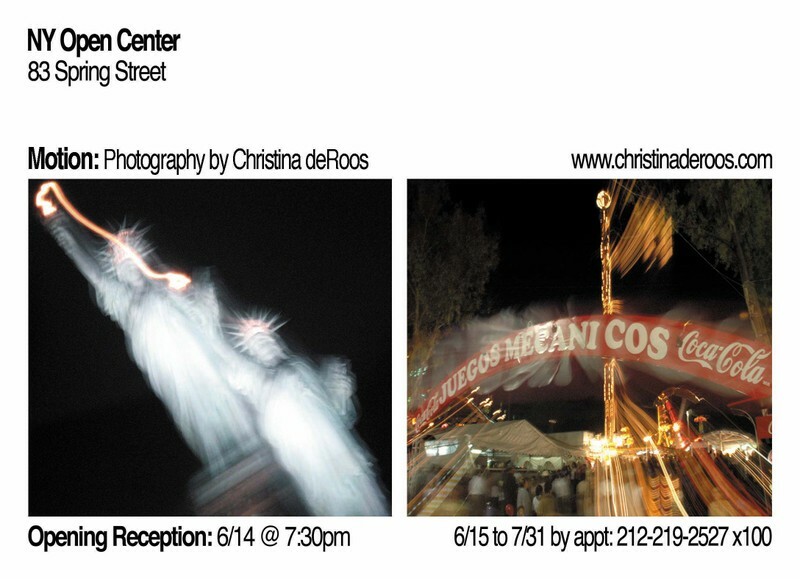 If you haven't seen it yet, you can still catch the show at the NY Open Center, 83 Spring Street, until July 31st. If you can't make it to the Open Center, click on the album to the right titled "Motion" to see the photos I included. Please have a look and let me know what you think. There are 14 images total and it will take me a bit to upload them. If you don't see 14, check back soon. Asap they will all be there. Below I've posted the artist statement and the email announcement for the show. Matted and framed 16âx20â prints are $375. Unframed 16"x20" prints are $150. Other sizes are available with various prices, so the easiest thing is just to email and we can figure details out from there. In all cases, I donate 25% to charity, so when you buy something you not only help sustain my creativity, you also help folks in Mexico or in NY, depending on which charity you choose to receive a gift. See below for more details about that. I took these photographs during a time of many planned adventures and many surprising plot twists. The main transition was my move from living in Brooklyn to living in La Manzanilla (Jalisco, Mexico). I see a wide range of emotions reflected in the series, from excitement to fear, disappointment to contentment, confusion to calm. Living in Mexico I often hear people say âasi es la vidaâ (âthat's lifeâ). I love hearing this because to me it honors the roller coaster aspect of our lives without making too big a deal of it. Motion is an asi es la vida series of photographs. Rather than a tidy package, it is a more spontaneous grouping that honestly reflects my recent experiences. While taking these photos, I spent a lot of time noticing how my life is always in motion and contemplating my different experiences of that. Sometimes the pace felt quick, with whole days or months going by in a blur. Other times life seemed to move more slowly, and occasionally a day or an hour seemed an eternity. How I experience life is a result of my inner landscape and circumstances as much as, or perhaps more than, my external surroundings. Photography and art facilitate my exploration of internal and external landscapes and how they interact and influence one another. All photos are printed on 11âx17â archival paper by Ken Allen Studios. Finished size (matted and framed) is 16âx20.â Matted and framed photos at this size are $375. Unframed prints are $150. Other sizes are available. I am pleased to donate 25% of sales to two nonprofits that provide life-changing programs to children and adults. Creative Alternatives of New York (CANY) provides drama therapy groups to traumatized and socially underserved individuals in NY. La Catalina Educational Foundation (LCEF) provides critical educational and economic opportunities in La Manzanilla, Jalisco, Mexico. I am honored to have worked with CANY and LCEF and to have witnessed the impact of their work. You can choose to have 25% of the purchase price donated to CANY, donated to LCEF, or shared between them. I'm writing to invite you to the opening of Motion, an exhibition of recent photographs I took during a time of many planned adventures (including moving from Brooklyn to the Pacific Coast of Mexico) plus a number of surprising plots twists. Living in Mexico I often hear "asi es la vida" (that's life). I love hearing this because to me it honors the roller coaster aspect of our lives without making too big a deal of it. Motion is an asi es la vida series of photographs. Rather than a tidy package, I invite you to see a more spontaneous grouping that honestly reflects my recent experiences. I am pleased to donate 25% of sales to two nonprofits that provide life-changing programs to children and adults. Creative Alternatives of New York (CANY) provides drama therapy groups to traumatized and socially underserved individuals in NY. La Catalina Educational Foundation (LCEF) provides critical educational and economic opportunities in La Manzanilla, Jalisco, Mexico. I am honored to have worked with CANY and LCEF and to have witnessed the impact of their work. Below are details about the specific programs that will benefit from sales of work included in Motion. Creative Alternatives of New York (CANY) is beginning two new drama therapy groups to help children traumatized by war. The first provides drama therapy groups to refugee children recently arrived in New York from war torn countries, helping the children through the challenges of relocating and beginning new lives in New York City. The second program provides drama therapy groups to children of veterans returning from the Iraq and Afgan wars. To learn more about these and other CANY programs, please visit www.cany.org or contact Jonathan Hilton, Executive Director, at jhilton at cany.org or 212.222.1969. La Catalina Educational Foundation (LCEF), responding to the 40-50% drop out rate in La Manzanilla, provides an educational scholarship to an underpriviledged middle school student who excels in academics, but whose family does not have the financial means to pay for the student to continue on to high school. In addition to tuition, the scholarship covers related expenses such as transportation (there is no local high school). To learn more about this and other LCEF programs, please visit www.lacatalinafoundation.com or contact Dean Klompas, Program Director, at la_catalina.dean at hotmail.com. Driving back from Manzanillo today there was a gorgeous sunset. I took a bunch of photos playing with the evening light, car headlights and palm trees. I've posted a few to the under the photo album "Manzanillo Carretera" on the main page.